The Simpsons Clip Database is an idea I’ve been tweeting about for a few years now. Every time I want to make a Simpsons joke on Twitter or Facebook, I search YouTube hoping that someone has managed to post the exact 10-second clip I’m looking for. For some people, this sounds crazy; for me, and others like me, this is common sense. The most common for me is any instance in which I am attending or discussing a BBQ: when I wanted to make this joke earlier this year, I searched YouTube and was excited to find a copy of the exact clip that every Simpsons fan knows I’m talking about because that’s how this works. It was filmed off a television screen, and could be deleted at any moment. However, it allowed me to both contextualize the reference for those who weren’t familiar, while simultaneously inviting those who get the reference to revisit the joke within the context of the episode, but through the logic of viral video rather than taking thirty minutes to stream an episode. We don’t think about The Simpsons in terms of episodes, not in our contemporary moment. While I will be happy to revisit various Simpsons episodes in their entirety on FXX or FXNow, and I will on occasion pull out my DVDs and watch a few episodes back-to-back, how we think of and use The Simpsons on a daily basis comes in the form of jokes, bits, and memorable sequences. The Simpsons travels in these bite-sized chunks, and the value of The Simpsons in the age of online streaming should ideally reflect this. What I’ve long proposed is an online app that allows you to create your own clips based on classic Simpsons episodes: users can select a brief section of an episode to isolate, create metadata to make it searchable within a database, and then share that clip through social media. Hypothetical: Should I eventually own my own home, I would instinctively want to make a “Homer Tax” joke. Currently, there is no clip of this joke from “Much Apu About Nothing” available online, but within The Simpsons Clip Database system you could isolate the scene in question, share it to social networks, and reinforce the almost terrifying degree to which The Simpsons is used to contextualize our daily lives. While there are some YouTube videos—like this one from the same episode, another oft-quoted line—that can serve this function, having the ability to find even more obscure references enables fans of the show to reinforce the degree to which their lives can be shaped by Simpsons references, the subject of a recent College Humor list. Right now, the non-linear deal for The Simpsons remains tied to FXNow and Video-On-Demand content, but this is referring only to non-linear ways in which people would watch episodes of The Simpsons. However, The Simpsons is an inherently non-linear cultural text, experienced in fragments and memories more than through concentrated viewing patterns. Although the series being widely available on FXNow is obviously a boon for fans of the show, it doesn’t necessarily enable them to engage with the show in the way that feels most natural, and in the way that would maximize the series’ exposure within the space of social media. 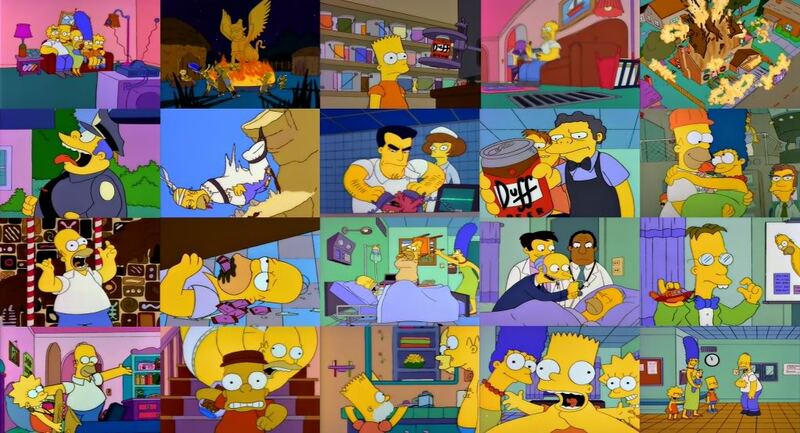 So here’s my pitch to FX and FXX: Work with 20th Century Fox to create the Simpsons Clip Database. Launch it in Summer 2014. At the end of every clip created through the database, append a brief reminder that all episodes of The Simpsons will be available streaming on FXNow, and on the FXX linear channel starting in August. Rather than having to promote the launch yourself, let the show itself do the work for you, and weaponize the series’ cultural capital to let the show’s fans spread the word of the show’s new home. I have no idea how the technology would work, or how long or short the clips would need to be to make the legal logistics work, but I feel confident that online streaming and video-on-demand are not the non-linear platforms where The Simpsons will maximize its cultural impact in the contemporary moment. What’s THAT extra B for? What a spectacular idea, and I would use this infitum. I just don’t expect the knuckleheads at News Corp to do it, even if there was a way to monetize it.